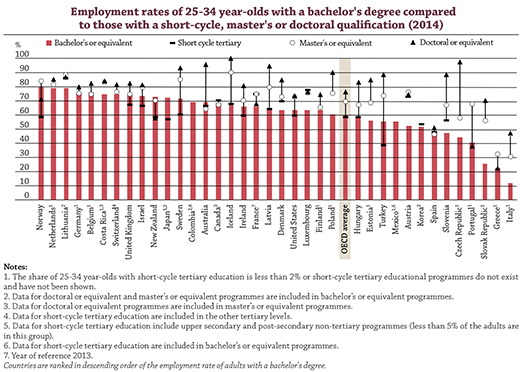 Do labour markets welcome shorter tertiary degrees? At the turn of this century, two different models of higher education programmes prevailed in the world. The first mainly consisted of three- or four-year programmes leading to a first qualification – a bachelor’s degree – sometimes followed by a “postgraduate” programme at the master’s level. This model predominated in the United States, the United Kingdom and most other English-speaking countries. The second model, prevalent in Europe, entailed long, integrated programmes – in some fields of study, six, seven or even eight years long - leading to a plenitude of qualifications. Emerging economies in Asia mainly copied the American model, while Latin-American countries mainly followed the model of the European colonising powers.